Conn Smythe's name was synonymous with hockey in Toronto for five decades. Having purchased the Toronto St. Pats in 1927, Smythe changed their name to the Toronto Maple Leafs, and altered their sweaters to the blue and white we know today. A powerful leader, Smythe had been coach, general manager and owner of the Toronto Maple Leafs before he was recognized by the Hockey Hall of Fame with his induction as a builder in 1958. It was around this time that Conn Smythe sold controlling interest in Maple Leaf Gardens to his son Stafford, Harold Ballard and John Bassett. 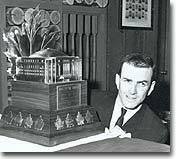 In 1964, Maple Leaf Gardens donated a trophy for presentation to the most valuable player in each season's playoff competition. 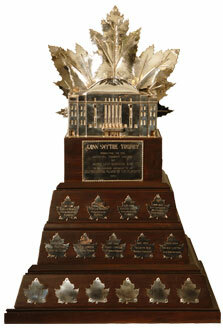 The Conn Smythe Trophy was fashioned to look like Smythe's beloved Maple Leaf Gardens, and was first awarded following the 1964-65 playoffs, with the inaugural presentation going to Montreal Canadiens' captain Jean Beliveau. There have been five players who have won the Conn Smythe Trophy as Playoff MVP while playing on a non-Stanley Cup winning squad (Roger Crozier, Glenn Hall, Reggie Leach, Ron Hextall, and Jean-Sebastien Giguere). Leading winners: Patrick Roy (3), Wayne Gretzky, Mario Lemieux, Bobby Orr, Bernie Parent (2). Voting is conducted by the Professional Hockey Writers' Association.